Our friends from the ship, Doug and Deb Bazley, from Australia had coincidentally planned to be in Prague the same time that we were there. They took the train on Wednesday, and arrived in the late afternoon. Texting each other, we made contact and planned to meet up the next morning for a guided tour of the Castle Complex. 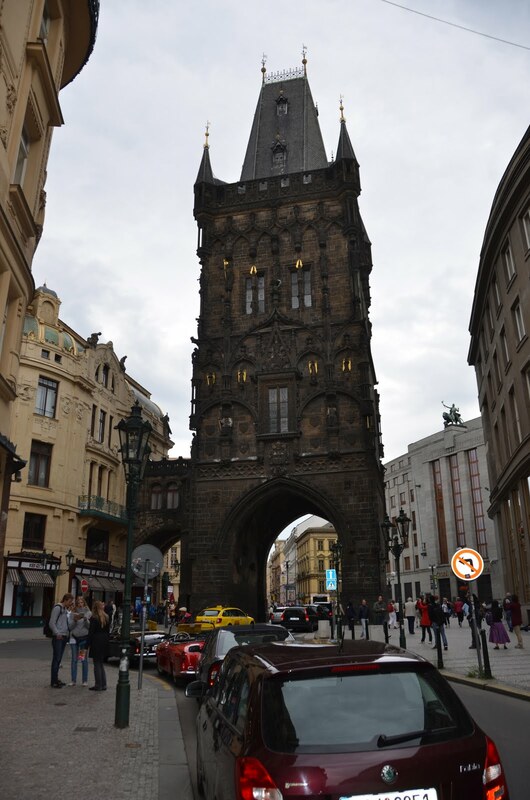 The old town of Prague is divided into several squares, which historically served as market places. Thursday morning we made our way by tram and foot to Republic Square, which was located not far from Old Market Square. The streets of the old town are winding and narrow, and Brian was fortunately right on the money with his directions, guiding us to the various locations. Although I am good with directions, I just never seemed to figure out what direction we were heading in! Republic Square seemed to be a hub for taxis, trams and buses, and the meeting point for tours. As we passed through the Powder Tower on one end, we saw the Municipal Building, which now houses tourist information and restaurants, and around the other side a small square and the Palladium - a 200 store enclosed shopping mall! Quite a surprise in this historic old city - but certainly a nice resource for locals and tourists - every modern shop you could think of, including, of course, Starbucks and McDonalds! We met up with Doug and Deb and boarded a small tour "bus" (holding about a dozen people) for the ride up to the Prague Castle on the other side of the river. I have provided a Wikipedia link for anyone interested in reading more about this beautiful area. The Castle was established in the late 9th century and has been expanded upon over the centuries. The President of the Czech Republic lives within the fortress walls and adjacent to the historic palaces, and has his office across one of the three squares from St. Vitus Cathedral. Our tour guide began the tour at the gate opposite the entrance to the President's home (not the main square). We arrived just before the daily changing of the guard, and were able to see some of it, although the place was VERY crowded with tourists and schoolchildren. Brian sneaked around the side and got some pictures. 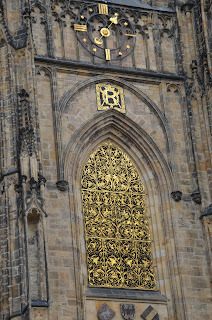 From there we walked through the second courtyard and into the third, where we joined throngs of people waiting to enter the magnificent St. Vitus Cathedral. 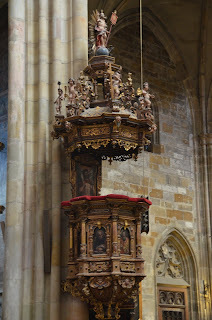 The best way to describe this present day Gothic Cathedral is for you to look at the photos posted in Brian's Gallery. 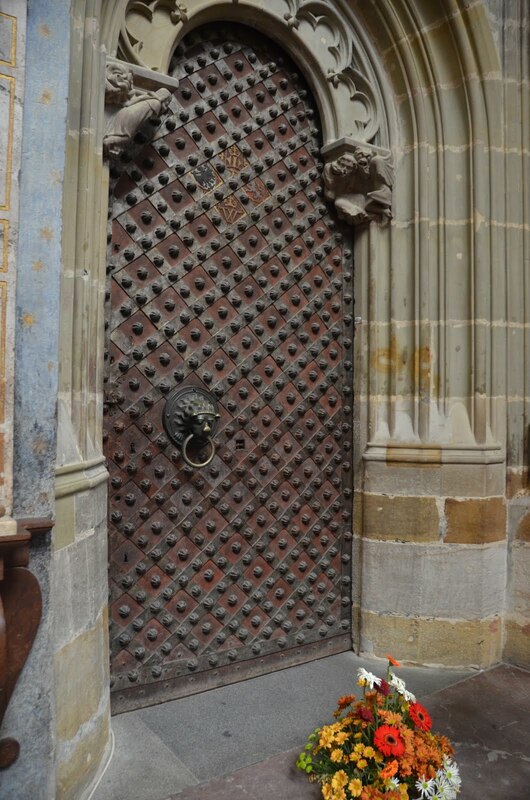 The existing cathedral is the third holy shrine on this location, the first dating back to the 10th century. 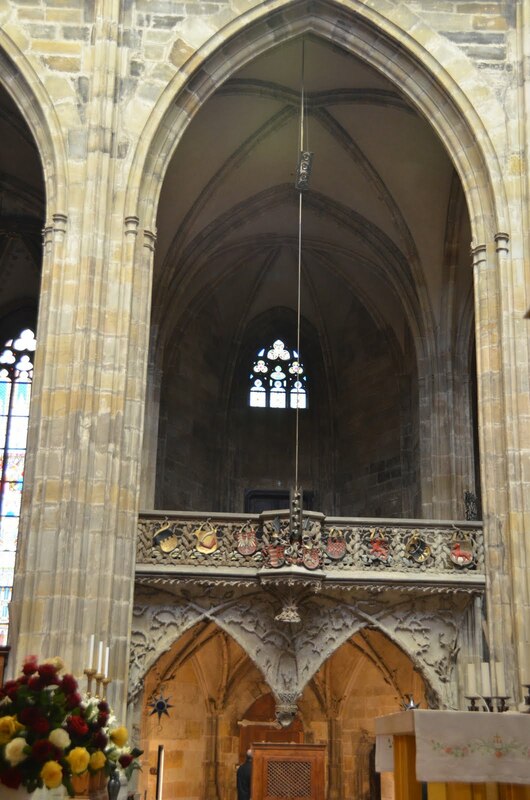 It is currently the seat of the Roman Catholic Archbishop of Prague, who lives in one of the historic palaces in the castle complex. 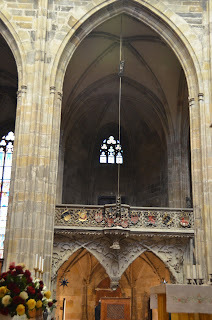 The Cathedral is connected by a passage way to the palace opposite the courtyard, and provided a way for the kings to enter the upper level of the cathedral and attend Mass, watching from their private balcony above. 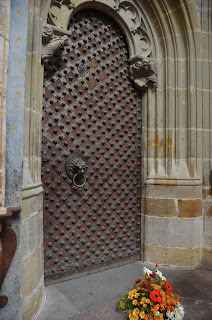 The Cathedral has a vault directly below the king's viewing balcony, which currently holds the crown jewels - locked behind several doors, and secured by seven locks. 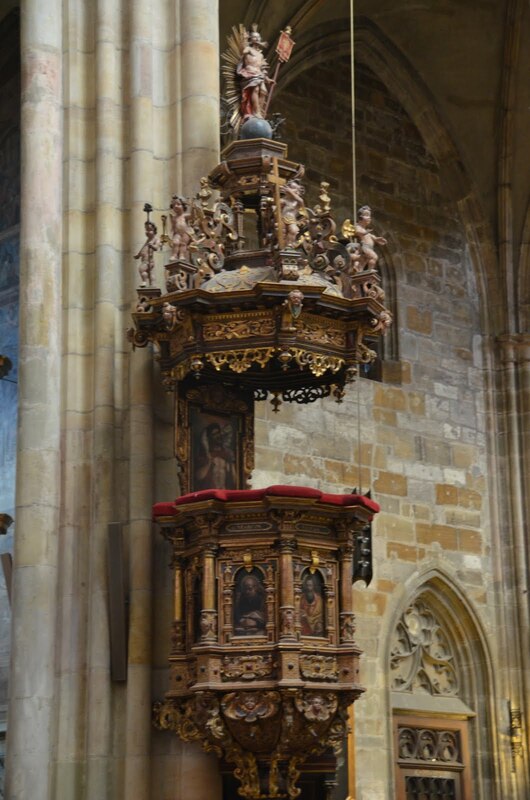 "Footnote" -- we saw as we traveled throughout Europe that the religious leaders, including bishops, bishop/princes etc., often lived luxurious lifestyles, owned a great deal of property, controlled magnificent artwork, and valuable jewels. While often influential leaders of their time, I wondered as we traveled through these areas what Christ would have thought about this interesting deviation from the simple life He led as he preached! Of course, I realized that historically the church often competed for power with the local kings and rulers of the many kingdoms, not much different from today's interplay between politics and religion, and, thus, things have really not changed much. As we moved toward the exit, we saw a beautiful sculpture of St. Ludmilla, grandmother of King Wenceslas, and responsible for bringing Christianity to Bohemia. 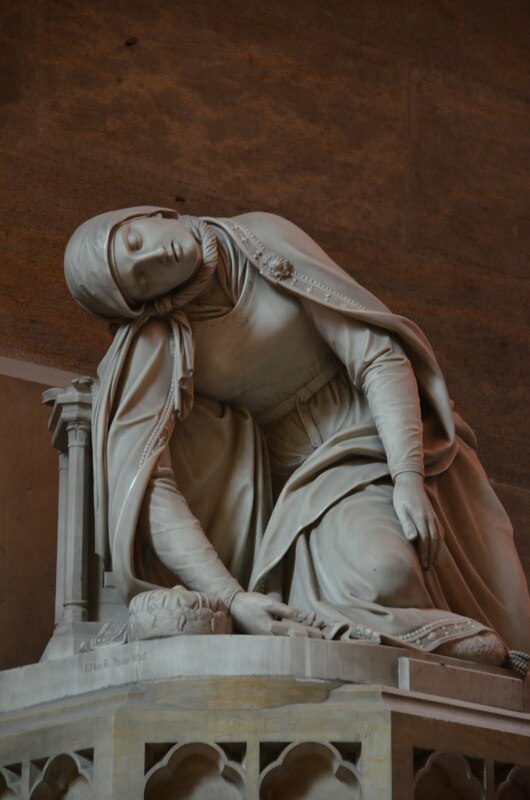 Her remains were buried in a small historic chapel built within the castle complex, behind St. Vitus. Following our tour of the cathedral, we visited the old palace, enjoyed views of the city, visited the St. Ludmila chapel, and then walked down the winding streets of the residential areas below to reach the Charles Bridge. Along the way we stopped at a little stand, where a man was making a pastry out of dough, which he rolled out, baked in a little oven on a round cylinder, then rolled in cinnamon and sugar. Of course, we each had one as a snack! 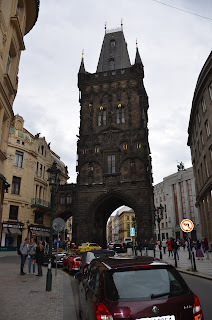 We wandered across the Charles Bridge again, stopping at some of the little artists' stands, and then made our way back to the center of the old town, where we parted with our friends until the next day - when we would meet for our SEGWAY tour!! That evening we ate at the local neighborhood restaurant, which was wonderful, and half the price of the pasta lunch we had the day before. I had roast duck leg, with the best purple sauerkraut I have ever tasted! As an appetizer, we shared baked mushroom with spinach and bleu cheese. Brian had a SPICY pot of stewed meat with traditional Czech dumplings and we enjoyed a local brewsky to go with the meal. I think the whole meal cost us less than $35! Food was very good in Prague. Tomorrow - Part 3 - Segway! 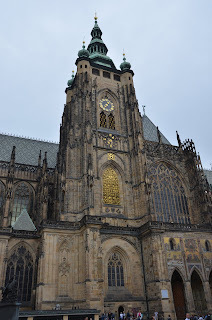 The St. Vitus Cathedral looks very interesting indeed. 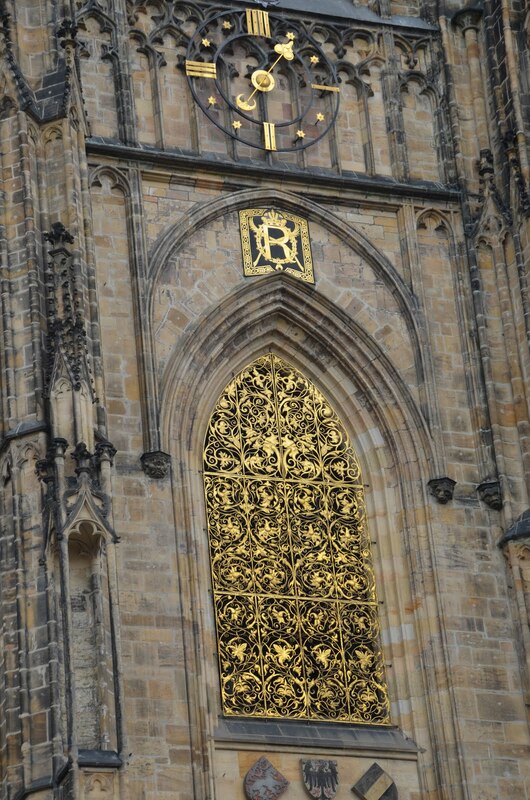 I would love to tour these old places of Prague.